26-pc. 3/4 in. 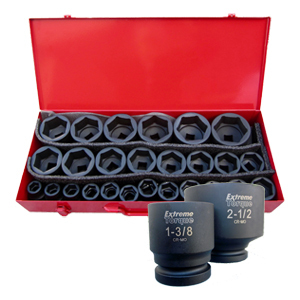 Dr. 6-pt Sockets (inch): 3/4, 13/16, 7/8, 15/16, 1, 1-1/16 1-3/16, 1-1/4, 1-5/16, 1-3/8, 1-7/16, 1-1/2, 1-9/16, 1-5/8, 1-11/16, 1-3/4, 1-13/16, 1-7/8, 1-15/16, 2, 2-1/16, 2-1/8, 2-1/4, 2-3/8, 2-1/2 in.